Senate Republicans joined together Wednesday to block a bill to increase the minimum wage to $10.10 an hour from making it to the Senate floor for debate Wednesday morning by a vote of 54 to 42. The measure was six votes shy of the 60 that would have been needed to bring the bill up for debate. All Democrats who were present voted in favor, except for Senate Majority Leader Harry Reid, D-Nev., who switched his vote to a "no" for a procedural rule that will allow him to bring the bill up again in the future. Sen. Mark Pryor, R-Ark., missed the vote because he was attending to tornado damage in his home state. But even if he had been present, Pryor had said the hike - up to $10.10 from the current rate of $7.25 in stages over the next 30 months - was too much, too fast. Sen. Bob Corker, R-Tenn., was the lone Republican to join the Democrats in voting "yes." Later in the afternoon, President Obama slammed Senate Republicans for the vote, saying they, "said no to helping millions work their way out of poverty." "This is a very simple issue. Either you're in favor of raising wages for hard-working Americans or you're not. Either you want to grow the economy from the middle out and the bottom up, so that prosperity is broad-based, or you think that top-down economics is the way to go," Mr. Obama said. He went on to say the time the GOP has spent trying to repeal or undermine Obamacare, as well as votes in favor of Republican Rep. Paul Ryan's budget, against a bill designed to reduce the gender gap in wages, and foot-dragging on an extension of emergency unemployment benefits show the Republicans aren't concerned about the majority of Americans. "They've increasingly failed at doing anything to help people who are working hard to get ahead," Mr. Obama said. "If there's any good new here, it's that Republicans in Congress don't get the last word on this issue, or any issue. You do. The voters." The president urged people not to get discouraged by the results of the vote, but rather to get fired up, to tell their representatives they are "out of step" on the minimum wage, and to put them out of work if they don't change. Senate Majority Leader Harry Reid, D-Nev., blamed the bill's failure on the billionaire brothers Charles and David Koch, who have been the target of scorn and criticism by Reid for months for their support of conservative candidates and causes. "If Americans are searching for an answer, why they would refuse to raise the minimum wage, they should look no further than the Republicans' billionaire benefactors -- I repeat, billionaire benefactors, the Koch brothers," Reid said on the floor Wednesday morning before the vote, when defeat was expected. He noted that Americans for Prosperity, a group backed by the brothers, has designated the minimum wage bill as one of their "key votes" that will be used to judge lawmakers' principles. Republicans, on the other hand, charge that Reid is pushing the bill - and refusing any attempts to compromise on a wage lower than $10.10 an hour, which the majority leader says is needed to lift a person working 40 hours a week above the poverty line - as a way to score political points. Sen. Susan Collins, R-Maine, said after the vote she has been in talks with lawmakers from both parties on an agreement that would raise the minimum wage by a smaller amount that would not cause as many job losses. "Unfortunately, the Majority Leader has already made it clear that he doesn't intend to allow any amendments to his bill - including any possible compromise. That is disappointing," said Collins, who voted against debating the bill in its current form. "Today's vote is an attempt to score a political point, but it doesn't move us any closer to raising the minimum wage. My focus remains on working together to reach an agreement on a responsible path forward." Sen. Tom Harkin, D-Iowa, the author of the minimum wage bill, said the bill would help 28 million people -- a figure his office says includes people both directly and indirectly impacted -- more than half of whom would be women, and more than 7 million of whom are parents. He says the $10.10 figure is not one on which he can compromise. "I know many are wondering if now is the time to compromise. I've said it before, and I'll say it again: I am always open to discussion on how to best get this bill to the President's desk. 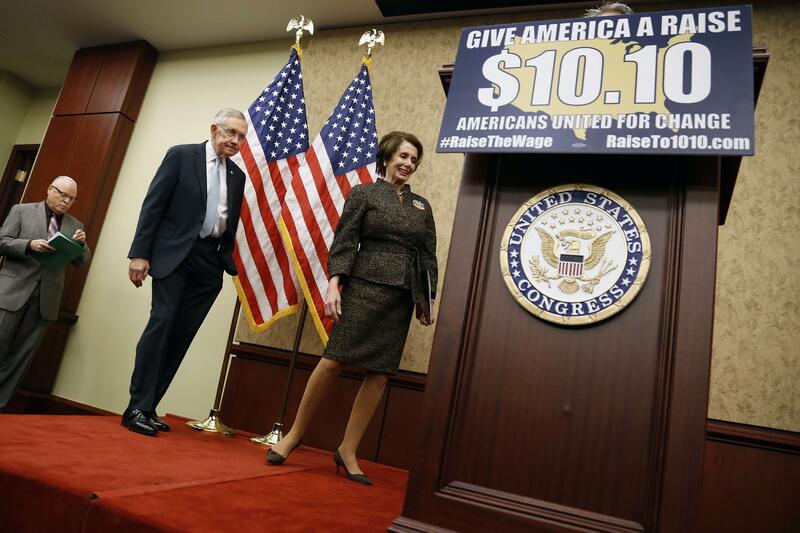 But we cannot compromise on $10.10, which is a wage that will lift working families above the poverty line. We cannot compromise on helping tipped workers get their first raise in twenty years. And we cannot compromise on indexing the wage to inflation," he said after the vote. "I cannot and will not support a bill that traps a full-time worker and his or her family in poverty. That's not good for our country or our economy. Because the bill failed in the Democratic-controlled Senate, it has no chance in the Republican-controlled House. House Democrats are attempting to force Speaker John Boehner, R-Ohio, to put it up for a vote using a procedural measure known as a "discharge petition," but are unlikely to get enough Republican signatures to constitute a majority of the House. Correction: A previous version of this article misstated the number of senators voting in favor of the bill.